. 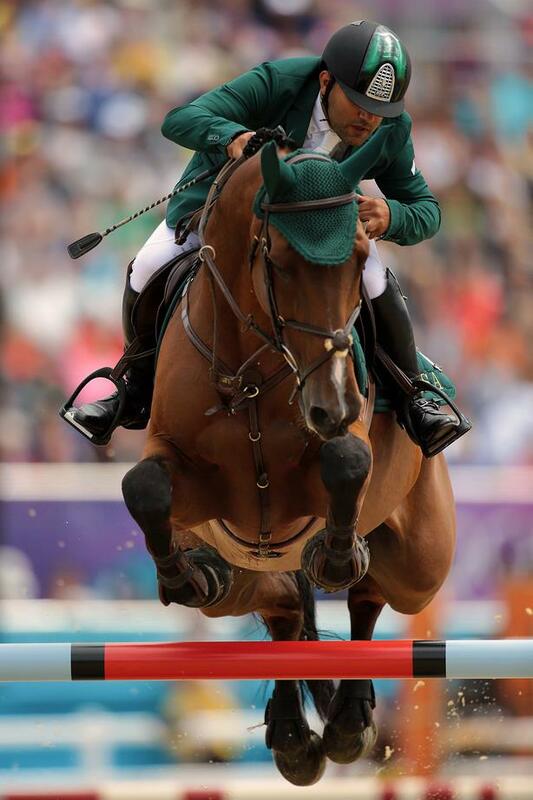 :: THE ARABS SPRING TO PROMINENCE - LONDON 2012 OLYMPIC SHOW JUMPING ::. The Saudi show jumping team sprung in to the attention of the world's equestrian fans as they jumped themselves into the overnight lead at the London 2012 Olympic Games. A total penalty score of one leaves them three penalties clear of several teams in equal second place; Great Britain, Netherlands, Switzerland and Sweden. But the story today was full of drama as the more fancied nations made a series of mistakes. Starting in traditional, torrential British rain, the second round of show jumping, which counts for both an individual and team scores, had a time of 88 seconds in which to clear some beautifully designed fences on the Bob Ellis track. These included Tower Bridge and a London bus as well as an 18 feet open water. The water was followed by the combination off a ninety degree left turn which most riders were concerned about. The individuals jumped first and Portugal's Luciana Dinitz got the round off to a great start with a clear on Lennox but after that the fences took more of a toll. Karim El Zoghby was the first of the Arabs to jump and performed rather well with just the middle part of the combination down and one time penalty which should do his chances of making the individual final some good. But the Ahmad Hamcho and Wonderboy sadly did not have quite such a successful time. Despite the best efforts of the 19 year old Syrian, his horse finished with 29 faults which means although he will jump tomorrow if he wishes, he has little chance of making the cut for the Individual final. Columbia's Daniel Blumen riding Sancha was next to score a clear round leaving the South American on a rather impressive zero score to carry forward and is one to keep a look out for. When the team riders began, HRH Prince Abdullah bin Miteb Al Saud and Davos were the first of the Saudi team to ride and could not have tried harder. The pair rode a brilliant clear to keep the challenge for a medal for Arabs right on track. Kamal Bahamdan made use of all his multi Olympic experience to finish with just one time fault. Ramzy Al Duhami and Bayard Van de Villa were foot perfect which mean they would go to the next team round on a score no worse than one penalty (best three count)whatever Abdullah Al Sharbatly and Sultan did. It turned out to be an outstanding piece of riding. Sultan decided to take matters into his own hooves after the water and Abdullah had to use every piece of skill and strength to turn him into the combination. Dropping his reins to give the horse freedom, Abdullah managed to negotiate the obstacle with only the middle part on the floor and finish the course with four faults, and it was indeed only the one penalty that Saudi Arabia carried into the last round. It was a marvellous team performance and whatever happens tomorrow, credit to the team's hard work and dedication. Of the other teams, Canada did rather better than on the opening day as their two legends, Ian Millar and Eric Lamaze both went clear. Marcus Ehning lowered the wall, McClain Ward was in the water and Simone Delestre lost a rein coming into the last and had to circle. Penelope Leprevost ruined her individual chances with eight faults on Mylord Cathargo as the French dropped down the team order. Rich Fellers and his World Cup winner Flexible jumped clear again to make almost sure of his individual final place as did the current Global Champions tour leader Edwina Alexander with her tiny partner Itot du Chateau. But all the scores were tight with only a couple of fences between the top eight teams and everything is still to play for tomorrow in both sections. 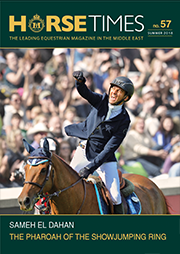 In the individual classification, Karim El Zoghby and Abdullah Al Sharbatly have now dropped just out of the individual classification and will need a clean sheet tomorrow, August 6, if Egypt's sole representative and the World Equestrian Games silver medallist are to progress, but the other three Saudi riders are in a very good position for the Final on Wednesday. - Today there were 16 clear jumping rounds. - Only one team, the Kingdom of Saudi Arabia, is still on a zero jumping score. They have one time penalty to carry forward. - Two riders did not come forward for this round, one for Canada and one for Brazil, which means they are down to three riders all of which will have their scores counted.